Writing a self evaluation can be a time consuming and difficult process. Finding the right words to describe yourself is humbling, and frankly, a challenging process. How do you write so it doesn’t appear you’re boasting, and for areas you need to improve in, without being too down on yourself? We have the solution! We’ve professionally written 450 comments across 30 self evaluation categories, each grouped into exceeds expectations, meets expectations, and needs improvement. These sample phrases are generic enough to be used by anyone, but specific enough to impress your boss and her managers. This book will not only save you time, but also provide you the highest quality self evaluation comments. Some people find writing a performance review easy, but when it comes to writing a self evaluation, they find the task daunting. This book is perfect for those who need to find the right words – as they are often their own worst critic. Every good performance management program has a self evaluation component. 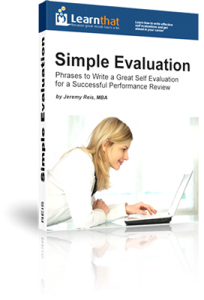 The self evaluation can be a difficult process for employees to complete and this book helps solve the problem for them. It includes an extensive collection of self evaluation paragraphs which you can easily copy and paste into your self evaluation form. If you’re looking for a book for managers to complete performance evaluations for their employees, check out our performance review book. Find out what our readers say in our book testimonials.